One of the few full portraits of a geisha in this series. 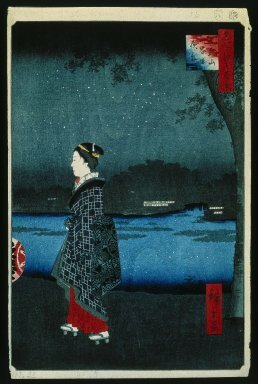 She follows the lantern of her attendant along the embankment of the Sumida River. The water reflects the stars and the sky. The San'ya Canal is the small inlet to the right, its entrance seen by the pillars of the Imado Bridge. On both sides of the bridge are two restaurants; on the right the Yumeiro (founded one year earlier) and the Takeya to the left. Small boats pass by the lights of the restaurants. The dark hill in the center, the "Matsuchiyama" has sexual connotations, having as the main object of worship in the Shoten shrine at its summit an Indian god in an entwined conjugal embrace. According to legend, the geisha shown here was a favorite of Hiroshige.